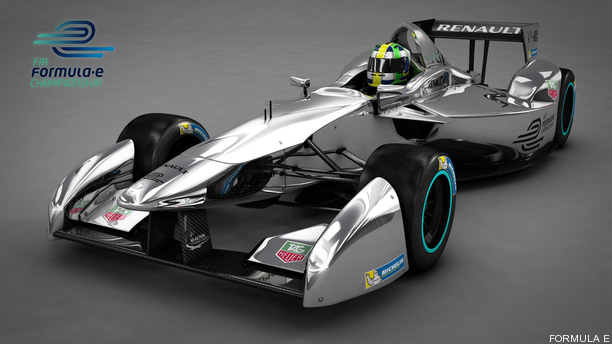 Spark Racing Technology has announced plans to introduce their Spark-Renault SRT_01E Formula E race car at the Frankfurt Motor Show on September 10th. Set to become one the most prominent race cars in the series, the SRT_01E has a Dallara-designed monocoque chassis that is constructed out of carbon fiber and aluminum. The model also features aerodynamic styling and bespoke Michelin tires that are specifically designed to last the entire race. While the McLaren-sourced electric powertrain can produce up to 270 bhp (200 kW), it will be limited to 180 bhp (133 kW) during races. However, drivers can use a 'Push-to-Pass' system which temporary allows the car to harness its full potential. This should enable the model to accelerate from 0-100 km/h in approximately three seconds and hit an FIA-limited top speed of 225 km/h (140 mph).